I apologize for the previous post, I was spammed by the internet robots. I have since changed my password, and hopefully it won’t happen again. And…since I did that thing that everyone tells you not to do, I have to change ALL my passwords, because my password for everything was the same. Not anymore, mind you, so don’t think if you figure out my Facebook password, you can get access to my bank account. Actually, you never could, because Facebook was the one password different than the others. Now, they are all different, and complicated! Take that, internet robots! Friday evening I was at Target with my cousin. We naturally spent a few minutes in the card aisle, where I found a new (to me) card company that I was quite impressed with. JustWink is a subsidiary of American Greetings, but with a more youthful, humorous, and trendy feel. After browsing their website, I’m even more impressed. 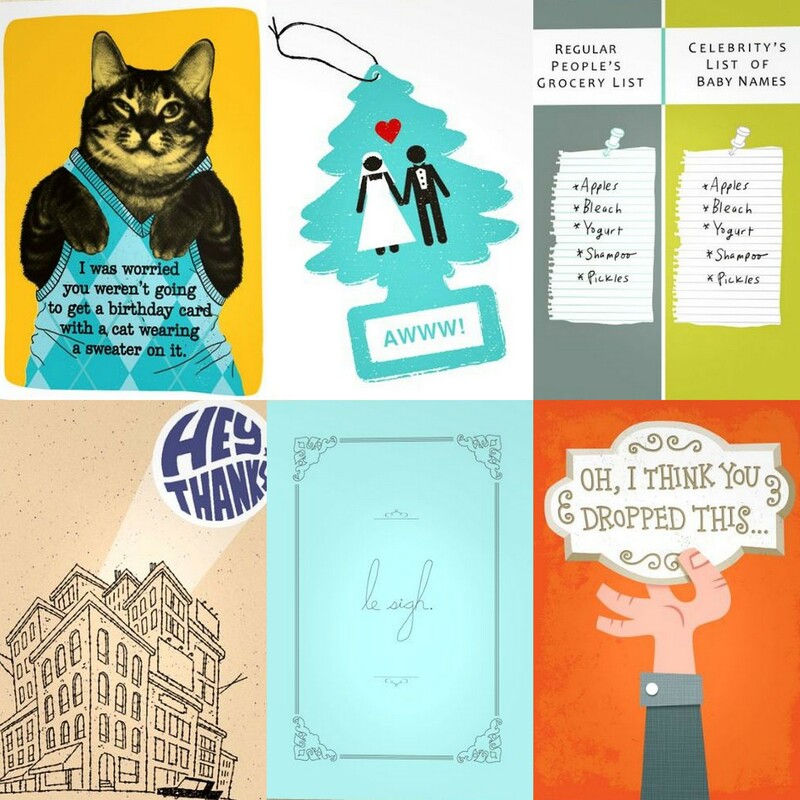 justWink = always-awesome cards that will work for every who what and when in your crazy life. We basically ask ourselves what dream greeting cards we WISH existed so we could send ’em to our people–and then we make those cards, so YOU can send them to your people and make them super-happy. Because we’re altruistic like that. But maybe the best thing about justWink (aside from the perfect cards) is that you can send ’em however you darn please: send ’em the classic & classy way, via Real Mail (from stores or our rad app), or send them via Text Message, Facebook, and Email (from our app or this site). Whatever makes sense forYOU. The justWink website connects with your facebook profile to give you reminders of your friends’ birthdays, and has an app for “on the go” card sending.You can send free interactive e-cards (through email, facebook, or text message), complete with photos and customized messages, and from their app, even send a physical card for a low fee. JustWink cards tend towards the snarky and clever…probably not cards I’d want to send to my grandma, but great for my friends and sisters. I even bought one for my sister’s birthday later this month. There are the usual birthday, wedding, new baby, thank you, etc, cards, as well as some more…unusual categories, such as “fml” and “bromance”. These were super easy. 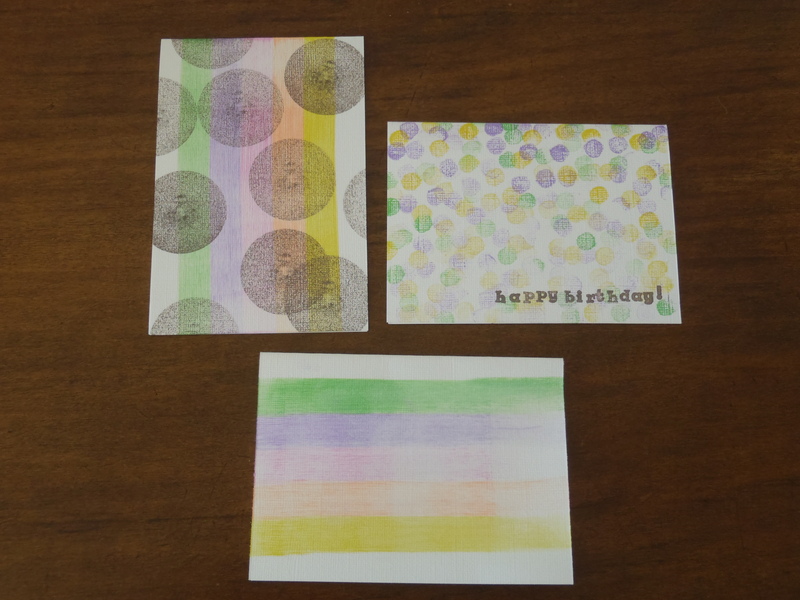 For the two striped cards (the upper left, and the bottom cards), I just pressed my stamp pads directly on the cards. The third card I made with a hand carved eraser stamp in the shape of a circle, and some letter stamps. I’ve made cards for years, but was never satisfied with the results. I’m finally learning that I don’t need to make cards like in the card making magazines, which are generally too frilly/complicated/cluttered for my taste. 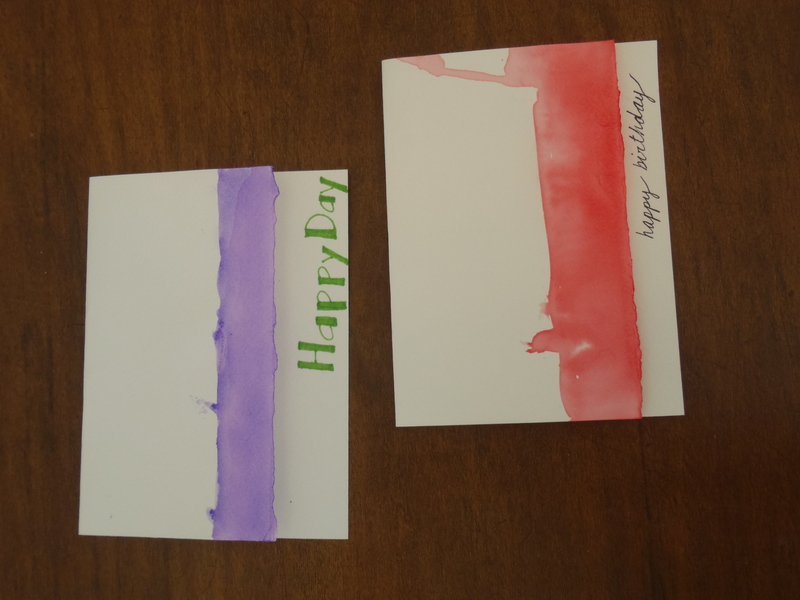 I like a cleaner look, and I have to say, I’m pretty satisfied with these cards, especially the watercolor ones. Hooray for figuring out my personal aesthetic! Three of which are already late. What can I say, we moved last week, and I’m just now organized enough to find my stationery box, my address book, and my stamps, all at the same time. Combining two of my favorite things: mail, and Rube Goldberg machines. 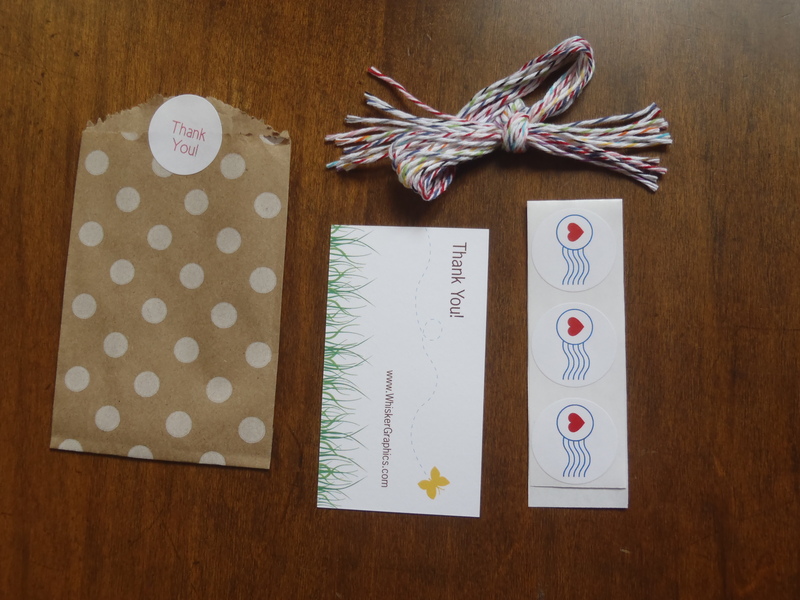 A few weeks ago, I won a giveaway on the Whisker Graphics blog, and it came! Whisker Graphics is a stationery and packaging company. I’ve bought products from them before, and been very impressed. It was packaged all cute. 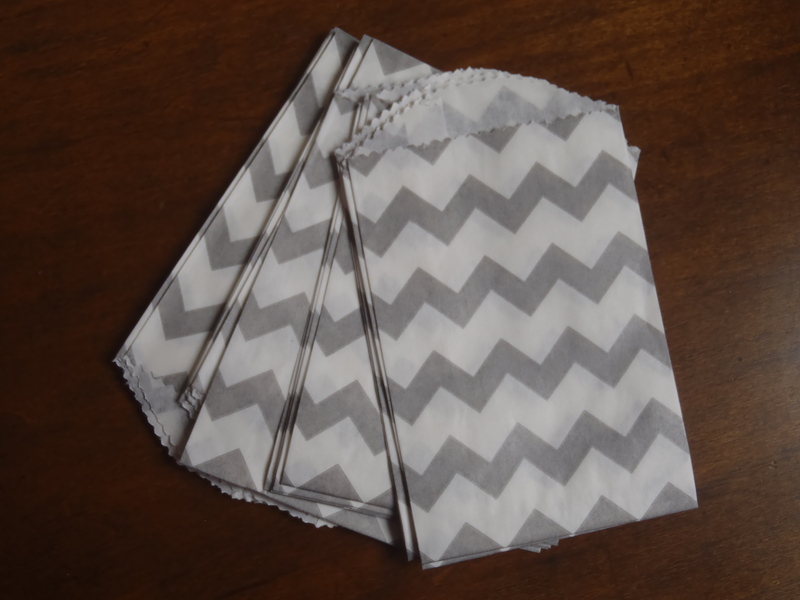 Inside was a set of gray chevron Little Bitty Bags. They included a bonus in the package, which they did when I ordered before, so I’m guessing that’s a usual thing. 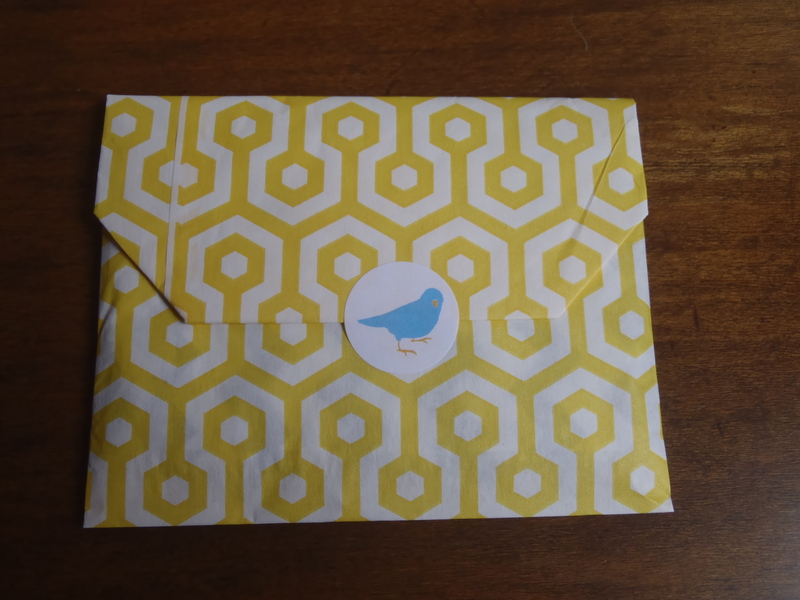 The bonus was a handful of Divine Twine and a strip of their Mail Love stickers (which I love), and one of their business cards. I haven’t used any of the bags yet, but they feel so nice! However, I’ve had some Mail Love stickers for a long time. I put them on most letters to my family, and they’re really nice quality. Thick stock, good colors, good stickiness. I’m currently experiencing a major case of Spring Fever. I want change, I want to be outside, I want to ride my bike, and color pictures on the sidewalk. I want to wear flipflops, and start my tan. I want to be 13, hanging out at the base pool with my friends. The weather has just not been cooperating with me, though, so I’m using this as inspiration for a package. Dinosaur Evolution T-shirt to celebrate the return of short sleeves. I’ve ordered from this Etsy shop before, and been impressed with their quality. Sidewalk Chalk encourages a return to childhood! The Outsiders…or really any good book to read while laying on the grass. A pair of flipflops, because nothing says spring like a new pair of Old Navy classics. Sunscreen to protect winter white skin. And a hat, since the inspiration for this series came from my sister and her boyfriend, and I think J’s head might fall off if he didn’t wear a hat. Go Navy! And what’s a care package without a treat? Pixy Stix are one of my favorites. They don’t melt, and you feel like a kid eating them. What could be better? My little sister, L’s boyfriend, J, is joining the Navy next week, signing up for a six year stint. 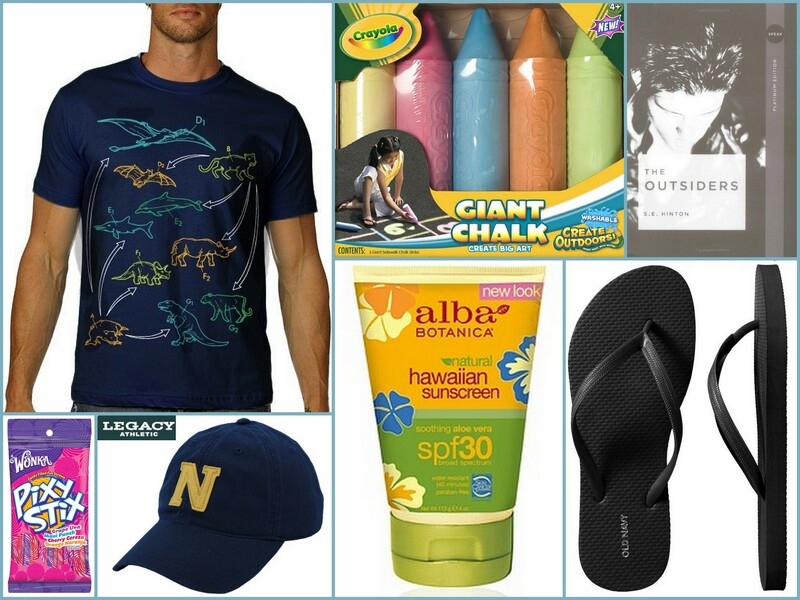 She has asked for a series of care package ideas for him, as I am an experience care package sender. There are a host of circumstances to take under consideration when assembling a care package. Distance, weather, and dietary restrictions all factor into the decisions of what kinds of food stuffs to include (a necessary care package ingredient in my book). Interests play a part, of course, but frequently the biggest concern is space. Not in the package itself, usually, as I’ve found that a medium sized flat rate box from the USPS holds a bounty of goodies, but in the recipient’s life. We tend to send care packages to college students, missionaries, and of course, members of the military. These people usually have small living spaces and move often, which means that too much “stuff” gets in the way. As an illustration, my Mom loves elephants, in all forms. We frequently buy her elephant cookie jars, etc as gifts. Were Mom a student, instead of an elephant cookie jar, I might buy her a t-shirt with an elephant on it. Or an elephant shaped flash drive. Elephant shaped sugar cookies. Something fun, and a little bit frivolous, yes, but still useful. With these thoughts in mind, I will assemble virtual care packages based on a loose theme. The first Parcel Planning post will go up shortly. I love mail. Who doesn’t, right? Opening up the box, finding an envelope with your name on it in someone awesome’s distinctive handwriting, a stamp, and that seal that they licked, even though they hate the taste? Because it was that important–that birthday card, or invitation, or letter. The photos of cousins far away. A postcard from a friend on a foreign adventure. The drawing from your niece. Or even better, a surprise package, or maybe one you hoped/suspected was coming (it is your birthday this week after all). And of course, the little something you ordered. Maybe it’s photos to frame and hang on the wall, maybe a treasure from Ebay or Etsy, maybe it’s a new pair of shoes from your favorite site, doesn’t matter, you know it makes you grin. I might be a little more obsessed than most. I count it a bad day when all we get in the mail is advertisements or bills. 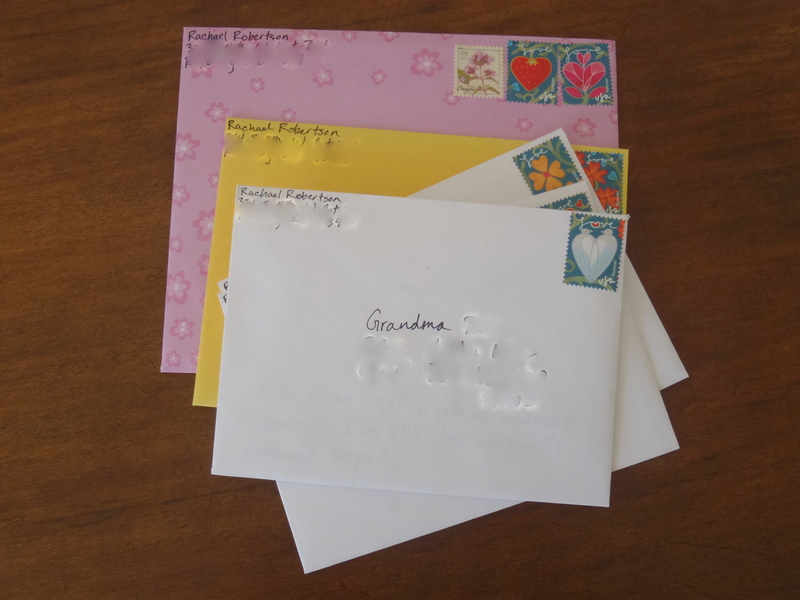 My New Year’s resolution was to send more birthday cards and write more letters. I get super excited when the USPS issues a new line of stamps. I follow both the USPS and the UK’s Royal Mail on Twitter (them, and a best friend from forever…I’m new to Twitter). I write lengthy letters to my sister and cousin (who I talk to and text daily). We went shopping together, and now I’m nowhere to be seen? Check the card aisle. My dream for the world is for everyone (everyone!) to get real fun mail at least once a week. Seriously. I think this would totally bring about world peace. In an effort to indulge my passion for the mail without bankrupting myself by buying out my local post office’s supply of stamps or Broulim’s entire stock of greeting cards, I decided to start this blog. Most “mail” blogs I’ve found focus either entirely on cards and stationery from independent designers, or on mail art, which is wonderful and exciting, but not quite my interest. I love love love cards and stationery, but I also live in a small town without a shop selling local designers (or if there is one, I haven’t found it yet!). Sometimes I don’t have time to order a card from an independent designer. I need a card RIGHT NOW, so I have to get a Hallmark or American Greetings card from the grocery store. And you know what? Not all of their products are horrific. In fact, most of them are amusing, and dare I say it, well designed. I know I’m not the only one in a situation like this, so while I plan to feature independent designers I do/would patronize, I’m also going to highlight the occasional product from the mass market lines. I’m not entirely sure how this new project is going to play out. I have a loose posting schedule in mind, but I’m not always great about schedules, so we’ll see. I hope you’ll come along for the adventure!